The Bushy Sea Rod is an interesting gorgonian that forms bushy, upward curving branches! The Bushy Sea Rod Rumphella aggregata, true to its name, is "bushy" and "rod-like." 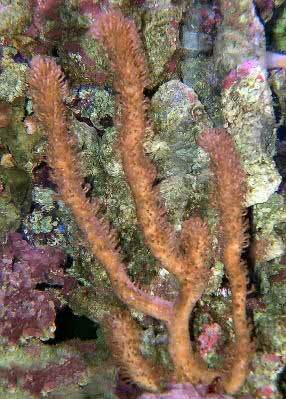 It has numerous long polyps on thick branches that are the same size from the tips to the bottom. The tips are nicely rounded off and club like. Colored in a pale gray to light tan with tons of yellow to brown polyps, and it is also commonly known as the Brown Brushy Sea Fan. The Bushy Sea Rod is a photosynthetic gorgonian found in the Indo-Pacific Ocean. They live on reef slopes at various depths. They are members of the Gorgoniidae family which have a central “chord” that is the main branch that the rest of the coral grows from. The structure is covered by a rind, which is a tissue layer, and there are polyps on raised areas of the rind. The rigid structure of branches consists of a protein substance called gorgonin, thus the family name. Bushy Sea Rods have a dichotomous structure which is a random “Y” shaped branch pattern as well as a lateral structure that are simply extensions from the main branches in the middle. The branches do grow in various directions, but seem to eventually curve upward. Other descriptive names for the Rumphella species are Bushy Gorgonian, Pacific Sea Rod, Sea Rod, and Sea Whip. The Rumphella species may be moderate to care for as long they have the necessary light and water movement. Due to the seldom import of these gorgonians, there is no way to really tell what their tolerance is. It is speculated that because of their various depth and temperature tolerances, along with the coral having zooxanthellae, that it may be an easier gorgonian to care for. Other gorgonians can over take the Rumphella corals, however, so they will need to be kept at a distance. The Bushy Sea Rod has a strong symbiotic relationship with a marine algae known as zooxanthellae, and receives some of its nutrients from it. Provide moderate currents and a good light source. Because it does need light, it may be easier to care for by being less demanding as far as feeding is concerned. It still needs supplemental feeding, but unlike gorgonians without zooxanthellae, it will not quickly die if not fed. See Care of Photosynthetic Gorgonians. The Bushy Sea Rod, Rumphella aggregata, was described by Nutting in 1910. They are in the Class Anthozoa, Subclass Octocorallia, Order Alcyonacea, and Suborder Holaxonia. Lastly the Rumphella genus is placed in the family Gorgoniidae. There are four species in the Rumphella genus. Different opinions about how living things should be grouped and named may put them under other scientific names, but these four have been described as R. aggregata, R. antipathes (Linnaeus, 1758), R. attenuata, and R. torta (Klunzinger, 1877). Yet these descriptions are subject to change as new information unfolds. Common names this genus is known by include Bushy Sea Rod, Bushy Gorgonian, Brown Brushy Sea Fan, Pacific Sea Rod, Sea Rod, and Sea Whip. The Rumphella genus are found in the Indo-Pacific Ocean. The Bushy Sea Rod R. aggregata is found in the Western Central Pacific near New Caledonia and Moluccas. They have not been evaluated by the IUCN Red List for endangered species. Gorgonians are found on back reef slopes where there is intermediate laminar flow. Bushy Sea Rods inhabit reef slopes at various depths, generally from 33 to 82 feet (10 to 25 meters), although in New Caledonia they have been reported as deep as 98 to 131 feet (30 to 40 meters). The Bushy Sea Rod from New Caledonia are found in deeper waters and have densely packed short rounded tubercles. The Moluccan species have sharply pointed, smaller sclerites. The Bushy Sea Rods feed on planktonic organisms, microscopic food particles and can also absorb organic matter from the water column. They also obtain nutrients from the marine algae, zooxanthellae, which they have a symbiotic relationship with. This genus of gorgonians is preyed upon by parasitic copepods and Murex snails. Predation also occurs with Butterflyfish and Parrotfish. The Bushy Sea Rod can get quite tall, reaching up to about 36 inches (91.44 cm) in length. It has thick branches that do not taper off at the tips, and the tips are nicely rounded and club like. They have a dichotomous structure which is a random “Y” shaped branch pattern as well as a lateral structure that are simple extensions from the main branches in the middle. This makes them flexible and they will not easily break. Their branches grow in various directions, but seem to eventually curve upward. Within very large colonies, the branches become more dense and have no particular pattern of growth. Lifespan is unknown. The Bushy Sea Rod is a member of the Suborder Holaxonia that have a rigid, yet flexible, structure of branches, and are further placed in the family Gorgoniidae. Their solid axel skeletons are made up of fused sclerites with collagen, a structural protein, as support. The skeletons are covered with the protein substance called gorgonin, thus the name "gorgonian." In the family, Gorgoniidae, there is a central “chord” that is the main branch from which the rest of the coral grows. The structure is covered by a rind, which is a tissue layer, and there are polyps on raised areas of the rind. The Rumphella species have numerous, long polyps which give them a "feathery" or "bushy" appearance, and they can come in tan to yellow and yellow to brown. The Bushy Sea Rod is typically a pale gray to light brown color with yellow to brown polyps. They also have zooxanthellae, a symbiotic marine algae, so will need moderate to high lighting. This gorgonian is red and brown with dense branches that can be tree or bush shaped. It is found at depths of 9 to 147 feet (3 to 45 m) in the Red Sea, Arabian Sea, Bay of Bengal and Indonesia. Commonly known as the Sea Gorgonian Feather, it is a greenish or grayish gorgonian found in the Red Sea. It builds long stems that droop at the ends, forming a bush-like colony. The polyps are close together, appearing “fluffy,” and it can grow up to almost 5 feet (1.5 meters) long. This species is found at depths of 16 to 82 meters (5 to 25 meters). The Bushy Sea Rod may be moderately difficult to care for so is suggested for an intermediate aquarist. Due to the seldom import of the Rumphella genus, there is no way to really tell what their tolerance is. It is speculated that because of the various depth and temperature tolerances of the R. aggregata, along with this coral having zooxanthellae, it may be an easier gorgonian to care for. It will need a tank that is 100 gallons or more with stable water parameters and zero phosphates. Provide moderate currents and a good light source. Lighting should be moderate to strong. Gorgonians in general can be overtaken by cyanobacteria or algae. A linear, moderate water flow can aid in preventing it from being overgrown. Also avoid wide fluctuations in water parameters, like salinity. While they have a lot of bromine, iodine, and tyrosine in their structure, they may not need regular iodine supplements. In the wild, Rumphella corals have developed several feeding strategies. They capture planktonic organisms and microscopic food particles from the water column, and can absorb dissolved organic matter. Unlike a lot of other Gorgonians, the Bushy Sea Rod has a symbiotic relationship with a marine algae known as zooxanthellae, where they receive some of their nutrients. In captivity, the Bushy Sea Rod can be fed enriched Artemia nauplii, rotifers, dust-sized pellet food, copepods, daphnia, and other similar sized foods. Marine Snow many also be a good food source. They cannot digest baby brine shrimp and will expel it later even if it appears they are eating it. Feed every other day depending on appearance. Diet Type: Omnivore - Nutrition is obtained by capturing food particles from the water column and absorbing dissolved organic matter, along with lighting and the marine algae, zooxanthellae. Live foods (fishes, shrimps, worms): Some of Diet - Live small phytoplankton. Feeding Frequency: Daily - Feed this Gorgonian every other day. Stable tank conditions are necessary to keep the Bushy Sea Rod. Doing water changes of 10% biweekly or 20% a month is needed, although it is suggested that doing 5% water changes once a week will replenish many of the needed additives. If there are higher concentrations of coral with calcareous skeletons, there may be a need put in additional additives to maintain proper levels for good growth. Calcium, strontium, and other trace elements can be added. While these gorgonians have a lot of bromine, iodine, and tyrosine in their structure, they may not need regular iodine supplements. Iodine Levels: - Add as directed on label. The Bushy Sea Rod is a large gorgonian that can reach up to 36 inches, so it will need a tank that is at least 100 gallons or more. A typical live rock/reef environment, along with some fish for organic matter production, is needed for this gorgonian to thrive. A mature tank (well over a year old) is advised to increase the successful keeping of R. aggregata. These Gorgonians are a peaceful species, but adequate space should be provided between them and other corals that can extend sweeper tentacles. Provide proper lighting and water movement. Since they also take nutrients from the marine algae, zooxanthellae, that they share a symbiotic relationship with, they will need moderate to strong lighting. It has been shown that lighting that has 350 to 550 nm is the most beneficial. A moderate water flow that is laminar, but not turbulent, will help to avoid cyanobacteria growing on them. They must be anchored down to keep them from getting blown over. They can be kept toward the bottom if there is strong enough lighting, but if the tank is very deep, they should be moved up. Temperature can be 68 to 83˚F (20 to 28˚C) with a pH between 8.2 to 8.4. Lighting Needs: Moderate - normal lighting - Moderate to strong with 350 to 550 nm. Water Movement: Moderate - A moderate linear water flow, preferably intermittent, but not turbulent. Water Region: Bottom - Generally placed on the bottom, but in the middle if the tank is deep. The Bushy Sea Rod is peaceful and poses no threat to any other corals or gorgonians. However, other gorgonians can over take the Rumphella corals, so they will need to be kept at a distance. Adequate space should be provided between them and other corals that can extend sweeper tentacles as well. Sponges, Tunicates: Monitor - Keep the gorgonian out of their reach. Shrimps, Crabs, Snails: Monitor - May be safe, but it is unknown if any or all species are safe. Feather Dusters, Bristle Worms, Flatworms: Safe - Should be safe, but it is unknown if any or all species are safe. Sea Apples, Cucumbers: Threat - The gorgonian can die if these expel toxins. They are much more sensitive to these toxins than other invertebrates, even if the system is large. Copepods, Amphipods, Mini Brittle Stars: Monitor - All are safe, however there are a few predatory copepods that should be removed before placing the gorgonian into the system. It is unknown if the Rumphella genus has been propagated in captivity, but the Bushy Sea Rod would be a good candidate as its characteristics lead to the assumption that it would be easier to keep than other gorgonians. The Rumphella species may reproduce by breakage or fragmentation, and they may also spawn like other gorgonians for sexual reproduction. When ready to spawn the Rumphella genus will release mature gametes into their digestive system, which is then released up and out through the mouth. After this spawning method, the zygote will develop into planktonic larvae or free floating in open waters. They will form tentacles, septa and a pharynx right before they settle into the reef with the mouth pointing upward. Propagation of gorgonians consists of using severing or clean cuts. Tearing the coral will result in infection. Be cautious with the use of glues, epoxy or cements, as many gorgonians react badly to the chemicals. However an underwater epoxy has been suggested by some. Containment is recommended if the frag survives. This involves keeping the frag in one spot. A small piece of upright pvc around the same height as the frag can be used. Sand or rubble at the bottom will keep the frag from blowing over before it can take root. It is suggested to drill holes in the pvc to keep the water flowing. The Bushy Sea Rod is susceptible to algae and cyanobacteria accumulating on its branches.The Rumphella genus, needing light, can get red band and black band infections that are caused by cyanobacteria. Keeping water flow strong will help prevent these ailments, but if your gorgonian does get these, you can at times cut off the bad part and hope the rest will recover. Freshwater dips can also kill cyanobacteria, and are an effective treatment. The Bushy Sea Rod Rumphella aggregata, also known as the Brown Brushy Sea Fan, is not readily available in pet shops or online, however, some reef clubs may have a specimen.